In technology, as in life, not all progress is in the right direction. Whilst our smartphones, tablets, laptops, even our watches are getting more and more powerful, we’re having to get used to charging our devices every day. I can’t be the only one who remembers when mobile phones only needed to be charged once a week, but now I have a smartwatch, a tablet and a connected pedometer to keep juiced up as well as my power-hungry Samsung Note 3! For most of us, this is a small price to pay for all the capabilities they bring to our daily lives and we can be thankful for one development - standardised battery charging. It wasn’t so long ago, every device would have its own unique charge port, but now most mobile devices will charge off a USB socket, even if a stubborn few need an adaptor (I’m looking at you Apple). Because of this agreed standard, there is a gadget that can help you keep everything charged up without needing every mains socket in the house or office to have a USB charger sitting in it permanently. 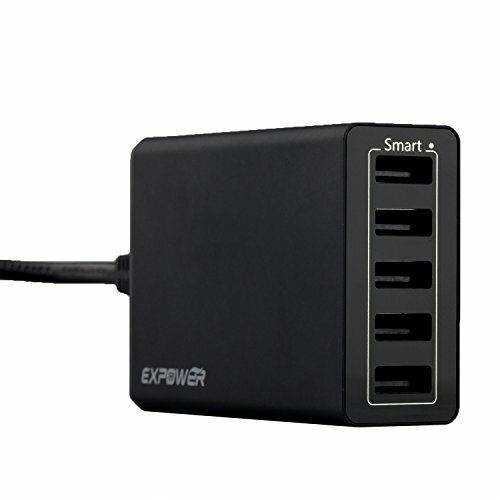 This is the 40W 5-Port USB Desktop charger from ExPower (Model EX-5840). As the 5-Port in the name suggests, it has 5 USB sockets allowing it to charge up your devices simultaneously whilst only taking up a single plug socket. Encased in a nice black smooth plastic, at 130g, it feels solidly made without feeling too heavy to stick in a bag if you’re travelling. The total output of the device is 8 amps but don’t worry, your phone won’t explode if it needs less flow of electrons to fully charge. When you connect a device for charging (there’s no data transfer here) the two units will negotiate the best charging rate thanks to some smart circuits and large (IE tablet) and small (IE smartwatch) devices can be charged up alongside each other, with each port juicing at the best individual rate. I’ve had one on my desk at work for a couple of weeks now and find it so convenient to have charge for my gadgets available all the time within arm’s reach. Topping up the smartphone and the watch is easy enough to do it without thinking, especially if you invest in a few cheap retractable USB cables to go with it. No more running out of juice, no more hunting for an available USB charger. Heartily recommended. Thanks to Smart Technology for the review sample.